BEST SELLER! NOW IN ITS 3RD PRINTING! ORDER WITH THIS OPTION TO DOWNLOAD THE PDF VERSION OF THE BOOK STARTING IMMEDIATELY. If you prefer to order a hardcover version, please click here. How Would You Like To Make Money When Traders Panic? Here’s How You Can Systematically Make Money When They Do. As all professional traders know, the greatest trading edges occur when money managers, investors, and traders panic. They sell-off securities, often-times to extreme levels and after they’re done selling, the strong money (the professional money) enters the market and takes prices higher. This behavior creates great trading opportunities for the professionals who know when to buy. And this same behavior has occurred over and over again for decades and will likely do so for years to come because human behavior never changes! 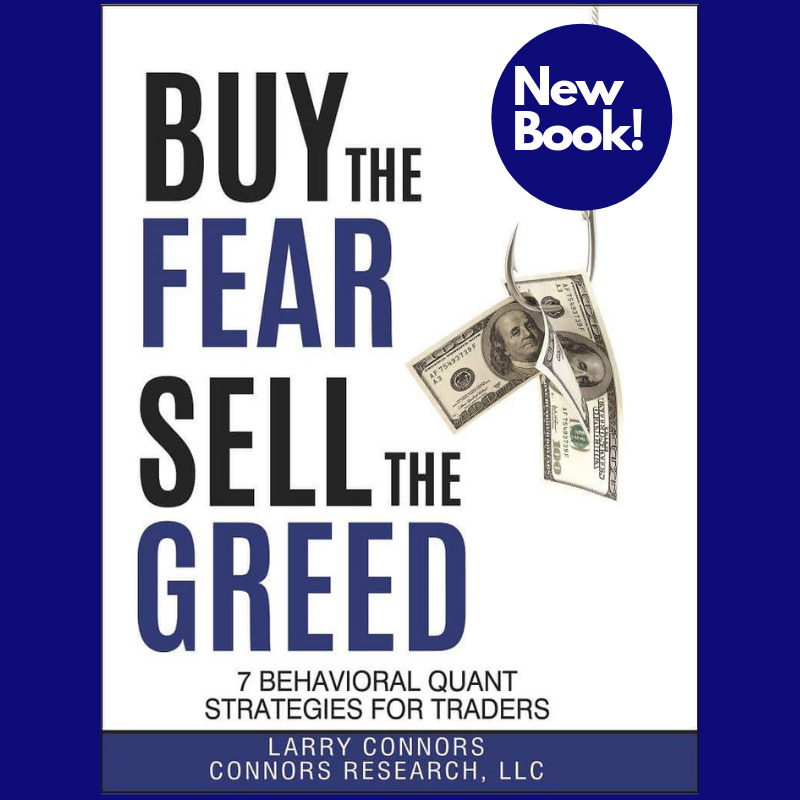 Now, for the first time, in Larry Connors new book Buy The Fear, Sell The Greed – 7 Behavioral Quant Strategies for Traders you will learn how to precisely identify when money managers, investors, and traders are fearful and panicking. When they are, substantial quantified trading opportunities exist for you to take advantage of. In Buy The Fear, Sell The Greed you’ll learn when to exactly buy these large edge, high probability times, and when to exactly sell. You will learn from the many strategies in this book that you will be buying low because fear is high and selling higher when the fear subsides. You’ve seen this play out over and over again nearly every trading day. Now, for the first time you will have a quantified, systematic way to identify and trade these often highly profitable trading opportunities. Why Do Money Managers, Investors, and Traders Panic and How Can You Profit From Their Fear? Imagine how someone feels owning a stock or an ETF which has lost money multiple days in a row. How do you think he feels when this happens? Now imagine he loses even more money again today. He feels even worse, doesn’t he? The horrible symptoms that come from stress and fear are now being felt by him. Dizziness, nausea, stomach problems, and fear of helplessness are all medically proven symptoms that accompany stress and fear. Now imagine that after the close, a negative news story comes out and the media induces panic overnight and that stock or ETF plunges even further the next day. The media quotes influential sources who state that prices can only go longer. How rational is this already stressed out and fearful person going to be? How does that trader react? Further losses, panic intra-day selling, and supposedly prices are going even lower often turns this person into a mental wreck. And people under this type of stress don’t act rationally! They panic and they often blow out of positions because the losses are so large and things look like they’re only going to get worse. Prices rise the majority of the time. They often don’t drop further, they actually rise! 1. Brexit rocks the world creating tremendous fear in the markets. The S&P 500 has its largest one-day loss in over a month. 2. On top of this, one of the leading Wall Street strategists sets off a further panic when reports that hundreds of billions of dollars of stocks will be in forced liquidation over the upcoming days. The financial media is in a frenzy as the market plummets over 5% in two days. This fear creates a buy signal taught in Chapter 2 of Buy The Fear, Sell The Greed. This strategy signal has been correct 91% of the time over the past quarter of a century. Fear is at an extreme and you will learn how to quantify and trade fear just like this because the opportunities are so great for traders who know when and how to buy during this time. Human behavior repeats itself over and over again in the markets. You will learn how to repeatedly trade like this over and over again in Larry Connors new ground breaking book Buy the Fear, Sell the Greed. So who profits during these times? The strong money that buys when fear is at its highest. In Buy The Fear, Sell The Greed, you will learn how to become the strong money. You will see this systematically time after time in Buy The Fear, Sell The Greed that the traders who are strong enough to take the stock from the weak sellers consistently profit. And they have so year after year for decades and it’s all quantified in the book. You’re the disciplined trader and they’re impulsive. You’re structured and they’re not. You’re quantifying and they’re flying by the seat of their pants. You’re now the strong money and they’re not. Over the years, through his books, trading courses, trading research, private group training, and one-on-one training, he has taught tens of thousands of traders how to trade. Asset Management Firms pay $100,000 for private strategies, research and insight from his firm. Groups pay between $10,000 – $25,000 a year to gain access to his trading knowledge. Professional Traders pay a minimum of $1000 an hour to be mentored by him. As powerful as Larry’s others books are, Larry, and others who have previewed the book, feel Buy The Fear, Sell The Greed is his best book to date. They feel this way because Buy The Fear, Sell The Greed is the first and only “Short-Term Quantified Behavioral Finance Trading Book” that’s ever been written. Other books like this may follow but now for the first time you will gain access to high-performing, quantified, systematic strategies based on fear and greed, the two main drivers of stock prices every day. Money managers, investors, and traders, repeatedly become fearful and pause their buying because of any number of things including upcoming economic reports, upcoming news events, or a current major news event. This fear sometimes lasts as short as a few hours to as long as a few days or weeks. When this fear occurs, buyers stop buying and sellers often accelerate their selling taking prices even lower. From there, historically large-edge opportunities appear for the smart traders who know when to step in and buy. Buy The Fear, Sell The Greed will teach you the precise times to enter and exit these high probability opportunities on a structured, disciplined basis to take advantage of these fear-driven mis-pricing of stocks and ETFs. If you are looking for ways to enhance your trading returns on a structured, repeatable basis, these quantified strategies are designed to exactly do this for you. This means every strategy has a fixed set of rules (fixed set of inputs) and is backed by anywhere from as short as 9 years of historical test results to as long as 25 years of test results. Buy signals occur when fear is high, and short selling signals on stocks and ETFs occur when greed is at its greatest. Throughout this book you’re going to do exactly as the books title states; you’re going to buy the fear and sell the greed. And the main reason you’re going to do this is because there are quantified behavioral edges that occur over and over again for you take advantage of. The greater the fear, the greater the mispricing of securities, which means the greater the edges are for you. In this book we identify when the fear is in place, why it’s in place, how to systematically trade it when it’s in place, and we fully quantify this going back as long as 25 years of trading. Step 1. Precisely identify where there is a high level of fear. Step 2. Enter the positions at exact times and prices when fear from money managers, investors, and traders is near or at its highest. Yes, it may be safer for them to come back into the market. It also occurs when prices are higher the majority of the time and when the quantified edges have disappeared. On average when it’s been “safer” to come back in, prices have been higher over 81% of the time up to 97% of the time usually within 3-7 days over the past quarter of a century. You will learn how to buy at the lower prices because of their fear. Step 4. You will be able to repeat this same trading process over and over again for the rest of your life. You have seen this – fear rises and then subsides over and over again. This consistently provides traders with high probability trading opportunities. This inherent market behavior has been seen for decades and is systematized and quantified for you in this book. 4. Fear Is Hardwired in Humans! This has been proven over and over by science. There are many dozens of scientific studies done with MRI’s which show that the brain changes when fear is present. Please remember this. It’s an important part of the reason the trading edges and biases you’ll learn from the book exist. There are no guarantees in trading and there are no guarantees of future performance in this book. But, human behavior, especially fear and greed, will always be in the marketplace. All the strategies in Buy The Fear, Sell The Greed take advantage of this repeatable behavior in a quantified, structured, systematic manner. 5. Why Do So Many Panic Sell-Offs Eventually Reverse? Legendary market strategist and technician Tom DeMark once said that real market bottoms don’t occur because buyers come piling back into the market or a stock at the same time. They occur because the selling has lessened or stopped. We agree with Tom because we see this statistically and you will too. The bottoms that occur when fear is high occur after all the scared money has sold. Sometimes the buyers immediately step-in. Other times (and this is more often), the buyers gradually return after they see conditions to be safer than they were. These buyers are buying after the fear has subsided. And they’re often paying a higher price and are buying when there are no longer short-term edges in place. Those who stepped in near the peak of the fear, are the ones who are consistently most rewarded. In Buy The Fear, Sell The Greed, you will learn a number of statistically proven ways to systematically buy the fear, oftentimes when fear is at its highest. You’ll be buying as the final sellers are selling out their stock or ETF, usually because they can no longer take the pain. Make money even if you get the direction wrong. Make asymmetrical gains when large moves in your direction occur. This strategy can be applied to all of your trading once you learn it and its taught to you in the book. What Tools Do You Need To Trade The Strategies in Buy The Fear, Sell The Greed? You only need a price chart and two simple indicators which are available on all charting platforms and from all brokers to trade the strategies in Buy The Fear, Sell The Greed. Buy The Fear, Sell The Greed is ground-breaking in its approach because it’s the first and only trading strategy book in history that quantifies short-term fear and greed. The book provides you with cutting edge strategies to specifically know when to buy and sell the high probability times when money managers, investors, and traders become too scared or too greedy and create tremendous statistically backed opportunities. You’ll have access to this cutting-edge research and the strategies supported by up to 25 years of historical test results behind each strategy. The cost of Buy The Fear, Sell The Greed is $49.95 ($29.95 if you order before April 28, 2019 – you save 40%). We’re so sure you’ll learn new strategies and new ways to trade from this book that we will give you a 60-day money back guarantee. Read the book, apply the strategies and if you are not 100% satisfied, return the book for a full refund. No questions asked. This is our way of showing you how confident we are that this book will significantly improve your trading.